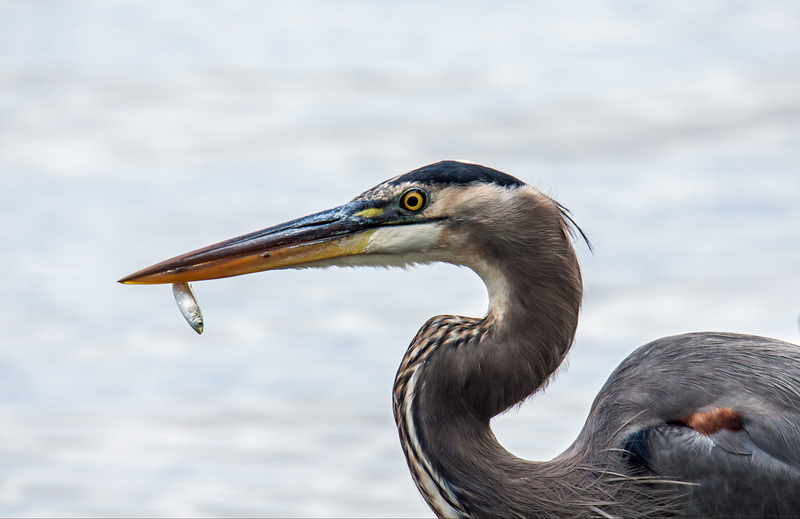 I have seen Great Blue Herons (Ardea herodias) catch fish so big that I was sure that they would not be able to swallow them, but I don’t think I have ever seen one catch fish as small as the ones this heron was pulling out of the water yesterday at Occoquan Bay National Wildlife Refuge. The Great Blue Heron was standing on the shore rather than in deeper water. As I watched, the heron periodically would catch and swallow one of these tiny fish and then return to scanning the water. It struck me that it would need to catch a lot of these little fish to make a satisfying meal. That is so small, he probably barely tastes it! Great photo, Mike. I have watched them on the shore, very early, eating small fish. I don’t know how they can see them. I managed to watch this heron from a good location that was not very far away from the heron, so I was able to zoom in pretty close. As I reviewed my photos, though, this was the only one in which we had a good look at the fish’s eye–I wanted to have the eyes of both creatures visible. Maybe on a diet? Fantastic photo, Mike. You made me laugh with this one, Mike! Very nice capture. It took a lot of shots to get that one with the eye of the fish visible, but it was the one that I envisioned, and I was thrilled I was able to get it. Thanks, the heron was close enough that I was able to fill the frame with its head and shoulders, which is what allowed me to capture such fine details in the heron, like some of the individual wispy feathers. Nice Mike! Maybe they were appetizers! It is amazing what they can eat. I have seen them eat fish so large it took 20 minutes to swallow it. Or small mammals & snakes plus things I could not identify. I have seen them it fish and a snake, but never mammals. Yikes! He must have been hungry! Love herons! My favorite bird and I rarely get to see them up close. They do fly over our house regularly! I was relatively close to this one, though it is a little deceptive because I had a long telephoto lens. Great Blue Herons are pretty common in the marshes and woodlands that I like to visit, though often they are skittish and fly away as I approach. I find that herons appear much more graceful in the air than on the ground.